We own a very specialized one of a kind custom built crane which we use for tree removal. We have 25 years of experience using our custom crane, and other cranes in dynamic tree work. Dynamic crane work is routinely (10% of their work or more) done by less than 2% of crane operators in the world. I do over 95% of my crane work dynamically!!! If a tree falls down in your backyard and nobody is home, does it make a sound? Yes, of course it does...and it also make a mess that can be difficult to take care of for most people. Many trees in Austin have a 30 years or less lifespan, so a fallen tree in your yard is a good chance. We have the equipment and man power needed to take care of any fallen tree in your yard, even if it's leaning up against your house. After a tree dies or is cut down one of the most difficult procedures can be removal of the tree stump and root. 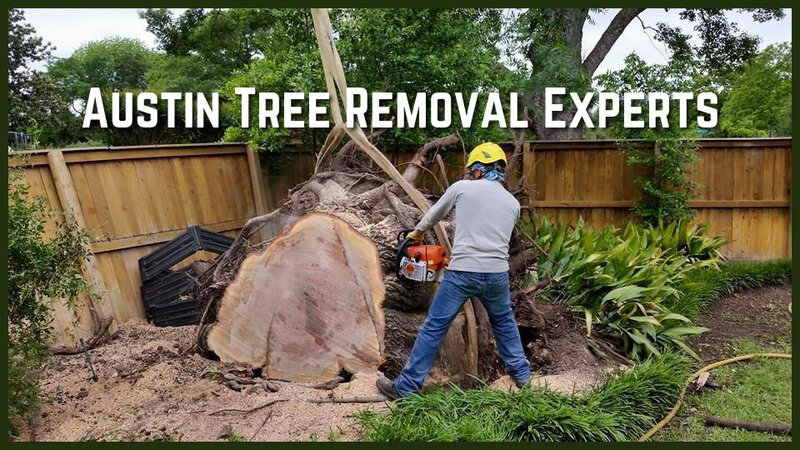 We have years of experience doing exactly that, and we use a specialized piece of equipment called a stump grinder to begin our tree removal process. Beyond grinding down the stump, the roots often require manual labor with shovels and chainsaws in order to fully extract them. If you are planning on landscaping or planting another tree in the same area, the stump and roots of the old tree almost always have to be removed in order to make space in the soil.